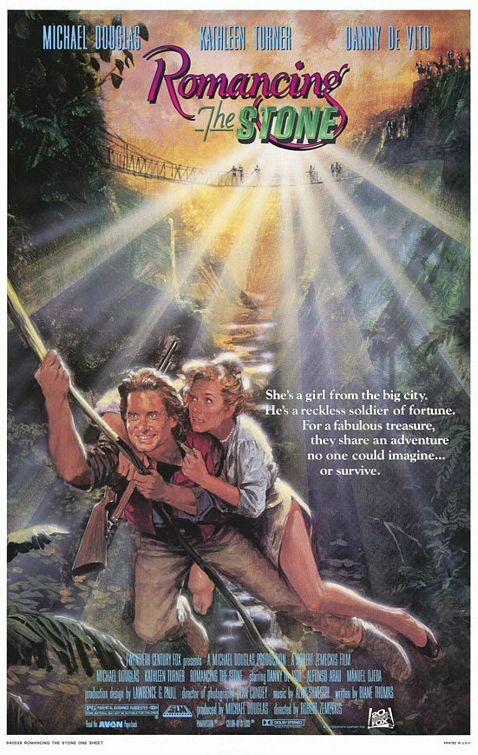 Directed by Robert Zemeckis, and considered one of the best movies of 1984- Romancing the stone is just one of those movies you need to watch. It’s a hands-down classic. The movie starts out introducing one of the leading characters, Joan Wilder. She has the interesting profession of being a romance novelist in New York City. She’s also a crazy cat lady and celebrates by drinking small bottles of hotel alcohol, while day dreaming of the hunk on the poster of her upcoming book. She’s just like any other ridiculous female. After a night of being told by friends and her book editor that she needs to find a man, she returns to a ransacked apartment. In the mess of it all, she discovers a “treasure map” and later finds out that her widowed sister has been kidnapped down in south america, by a couple of antiquities dealers. They want the map she has and her sister will be held for ransom until they get it. Now this is where the page is flipped for the usual quiet, cat lady of a character. She is now forced to drop everything in a moments notice, book an instant flight to Columbia and is on her way. And to say the least, it’s the not the most peaceful journey. Once getting to Columbia, she is detoured to the final meeting spot, by a man who killed the sister’s husband- Colonel Zolo. She is sent inland vs. the coast destination she was suppose to end up. But of course, she doesn’t know that. She’s on a bus, a hectic, country bus that later crashes into a parked car in the middle of nowhere. Everyone walks off fine, but Joan is being thugged up by some guy in a suit. Who saves her is a man by the name of Jack T. Colton, an exotic bird smuggler and the owner of said car which is now destroyed. Guns are pulled out and Jack saves the day. You already know that Joan and Jack are going to end up together. But of course, the start of this romance isn’t so easy. Joan convinces Jack to get her to a telephone, for a fee and he agrees. The next chunk of the movie is spent in crazy adventures, running from the back guys and meeting up with a drug dealer who is coincidently in love with Joan’s work and agrees to help the two out. THEN! Jack has the bright idea of finding the treasure of the infamous map and keeping it before handing it over for ransom. They do. It’s a pretty little emerald. But of course, the two are separated by a crazy river accident and one has the map, the other the jewel. Joan goes on to contact her sister. Joan meets up with the bad guys, gives over the map. She founds out that they’ve already caught Jack and in the midst of saving each other being threatened by gigantic reptiles, the jewel is gave up and Zolo is one proud man. Holding that jewel in his hand, he is sooooo lucky to be alive. NOT. The gigantic pet crocodiles he has, then bites off his hand, the hand only the giant emerald and this is where the chaos starts. The film ends rather dramatically, with both sides fighting to the death with every gun they have and the two sisters slipping away in the hectic, gun powered air. That isn’t the end of it though, because they are then followed. Zolo fights with Joan, knives are involved, Jack is fighting with a crocodile and bam! just Imagine that scene. It’s pure movie magic there.They both dodge, Jack gives up on the croc fight and helps his lady out. They win, they kiss and Jack jumps back into the water to get his emerald. The story returns to New York city. Joan writes a book on her obviously, novel worthy adventures and her editor absolutely adores it. The last couple scene’s is this old cat lady’s man showing up in a sail boat, planning to take her on another adventure. Just by reading that narrative, you must be itching to actually watch the real life film itself, arent you?Whenever I think of this film, I get instantly pulled by to my 20th birthday and a party that involved all my friends. There was good cake, and there was a living room stuffed with familiar faces. It’s good fuzzy memories, and I highly believe that the classics should be watched with others. What I also really liked about this movie and how easily adventures can happen. Maybe not to the extreme that was in said film, but just going outside and checking things out on whim might lead to something that perks things up. Changes who you are and kicks you out of that corner you’ve been hiding in. So! Go! Find! Someone! You! Like! and! Watch! This! Film!